Giveaway: Your choice of an 8x10 Lollieland FINE Print. Lollieland Designs is run by a "happily married lady working her way through college while saving to move to China with her husband for graduate school". Which means when you purchase one of her designs you are really supporting "starving students". Lollieland Designs are "made with your place in mind". One visit to her shop and you will see plenty of things that would look perfect on your walls. Ever since seeing this one, I can't stop thinking about it. Our kitchen is yellow and white and the red accent is just what I have been looking for. Besides, I need the constant reminder. Lollieland also does custom orders, she will work with you until you are completely satisfied and be happy to offer suggestions along the way. When I contacted Lollieland she immediately suggested a custom print for Courtney. She wanted to give her something extra special. As a result of her thoughtful efforts, she has done just that. Are your walls missing something. Leave a comment on this post telling me what Lollieland Design has been "made with your place in mind". Be sure to tell me what room you would like to hang the print in. I don't care too much for money cause money can't buy me love! LOVE IT! My favorites are "come what may and love it," "Shake it like a polaroid picture," and "A Child's Prayer." I don't know what room I'd put it in - I'd find a place! I'd love the "here comes the sun" print for my baby's nursery or the "keep calm and carry on" for my kitchen. It's too hard to choose! caged song would be amazing in my bird themed nursery. I love the custom print for CJane the best, but all the prints are incredible! I love the Come What May and Love it one. Home can be a heaven on earth is great. "I DON'T CARE TOO MUCH FOR MONEY, 'CAUSE MONEY CAN'T BUY ME LOVE" - since that song is permanently in my head, I would love the print! I would choose Home Can Be A Heaven on Earth. Love it! I like the "Come What May and Love It" print. The "Stay Little" print would be perfectly sweet (in a little bit of a bittersweet way) for my daughter's room. I love the "Keep Calm and Carry On" as well as the "The Song of the Righteous is a Prayer Unto Me." I'd probably put it in my room - to be able to see it everyday! Isaiah 9 - hanging it in the entryway! I LOVE the very first thing on her Etsy page, the custom silhouette. LOVE LOVE LOVE. I would love silhouettes of the whole family and I might hang them on the stairs, or in the lounge, or above each persons bed, I don't know! I might have to get multiples and hang them everywhere because I love them so much! "Love is Spoken Here" would be so sweet in my baby girl's room. Stay Little is perfect for my only girl's new girlie room, but Love is Spoken Here would be a great reminder in the kitchen. How much fun are these! I love them all! The Caged Song print would be right at home in my family room. Love the graphics! I would love the Keep Calm and Carry On print or the Child's Prayer. I'd probably put it in the dining room or our computer room so everyone could see it! "stay little" for my baby's room, 'cause i'm in that sentimental mode. I would love the Keep Calm and Carry On print, especially since my husband is British. It would go somewhere I would see it often. I love Keep Calm and Carry on for in the kitchen! "Shake it" for the kitchen! Here Comes the Sun! I'm a huge Beatles fan and I love those colors! I would die for a custom portrait of my son. Love them all but I think I'd have to have "Thick of Thin Things" for next to my bathroom mirror to keep life in perspective! I like the Isaiah 9 print...I love Christmas decorations that aren't obvious. "Love is Spoken Here". I would hang it in my entrance way where everyone could see it. I think that every once in awhile each of us needs a reminder of how to treat the ones we love. Home can be a heaven on earth and the silhouettes. Awesome! Sleep in Heavenly Peace 4 me is sublime! I would LOVE to put the child's prayer print in my little girls room--so beautiful! I would hang it in my entry way. Love the Keep Calm and Carry On! I would use it in my family room. love is spoken here for the top of the stairs so the kids (teens!) can see it every time they go by! I love the silhouette, fine art and "here comes the sun"! Love the Come What May and Love It! One of my favorite quotes! The Keep Calm and Carry on would go well in my kitchen - the place where things can turn south verrrrrryyyyy quickly. For the silhouettes I am crazy!!! I would love the customized silhouette of my son for his new big boy room! I would love a silhouette of my little girl before she becomes a big girl!!! It would hang on my "family wall" in the entry. I would love the custom silhouette of my son. It would hang in my bedroom! The caged song print would go great in our family room! Oooh! I want the Come What May and Love it print-that is my motto!!! I love the "Sugar and Spice" custom print for the nursery--amazing! My favorite is the Come What May and Love It Print! Also think cjane's design is great! I want the sugar and spice custom print....so cute! I'd love the Pray He is Here poster for my girls' or boys' room. I have sang that song to each of them since they were newborns. Isaiah 9 For Unto Us a Child is Born Christmas Print! "Love is Spoken Here" would be perfect for our family room! Custom silhouette's of both my girls would be so fun to hang in their room. "Love it spoken here" - would love it for our kitchen. I like the wordle quote art. It'd be great over the fireplace. I la-la-love the La La Love You scrabble print...so clever. And it would 'fit' perfectly on my wall 'collage'...a wall filled with pictures of family and friends! I love the "here comes the sun" especially since the sun hasn't been around too much this winter!! I like Child's Prayer and I'd put it in my boys' room. Be Calm and Carry On. It is a perfect mantra for me and it reminds me of my grandparents who lived in WWII Britain. Home can be a Heaven on Earth! It would go perfectly in my house... and not just cuz my house is heaven ;). I love the Song of the Righteous. I would put it in my home office, to see and remember my God-given talents, and that I need to put them to use, bringing joy to others and to God! "Come what may and love it" I loved that talk by Elder Wirthlin. I LOVE the Labrador puppy print with the name especially if it were customized with my furry friend's silhouette and name! I want "Keep Calm & Carry On" to hang in my bedroom....which currently has totally blank walls!!! I like the "Here comes the sun" print for my son's room. I'd hang "Come what may and love it" in our kitchen/family room area because that's where we spend most of our time. Good reminder! I looooove the Come What May and Love It print. SO CUTE! I love Child's Prayer and would place it in the nursery. Love is spoken here is kind of a theme in our home so I would love, love, love that! "Shake it like a polaroid picture" made me giggle. I'd love to put it in any of the rooms where my daughters and I have impromptu dance parties! I want the Song Of The Righteous print. I would love it in my hallway. Here Comes the Sun for my kitchen! Love is spoken here for our family room! For my own home I love "Sleep in Heavenly Peace" for a bedroom. HOWERVER, I would really like to win "Keep Calm and Carry On" for my sister. Her husband has been layed off AGAIN for about the umpteenth time in this economy. She is really sad a struggling and this would brighten her day while reminding her to use her tremendous faith! I loved the silhouette! I'd love to have one for each of my kids. I also loved the "Home can be a heaven on earth" print. I'd put it in my living room. 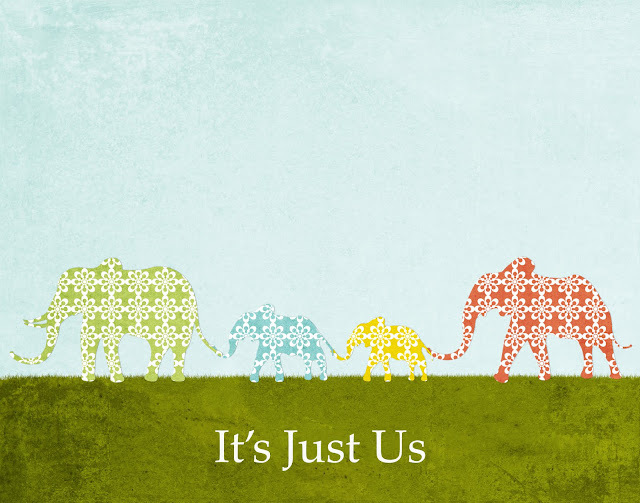 I LOVE the new It's Just Us print with the elephants! It perfectly represents my family...myself, husband, son and daughter. I would hang it in my family room for all to see! Sleep in Heavenly peace! So perfect for a nursery. I grabbed a Family Volley Button! i don't know how i would pick just one. i love all of them- but i have been thinking about silhouette's of my girls. I have subscribed to the Lolliland feed. I love the stay little print...I want my baby to stay little and not grow up so fast. "Keep calm and carry on" in the original red would go perfectly with my London wall next to the stairs. C Jane's custom print is amazing!! For me -- the "stay little" print would make a wonderful shower gift. I would love the "Stay Little" print! I'd of course put it in child's room! The "stay little" print would look so cute in my upcoming baby's room! We've kind of got an Indian theme going on in our home, so the Elephants in Love print would be perfect! I'm so in love with "Shake it like a polaroid picture." The Here Comes the Sun print would look amazing in my office. The "Child's Prayer" is perfect for my nursery! i absolutely love this "it's just us" print. we are having our second little boy on the 28th of this month and this print would fit perfectly in our home! i also love the print "come what may, and love it" it is definitely our family's theme for this year. I would get the elephants in love. My family has a huge obsession with elephants. Keep Calm and Carry On...and I'd hang it just inside my front door so I could be reminded every time I leave my house! I love the "it's just us", but I love the elephants and the birds as well! Oh my I love so many of them. I would love the Child's prayer for my baby's room. I also love the Come What May and Love It. I would hang that in my living room. forgot to put that it would go in my bedroom. Thick of Thin Things- definitely a good one for me to see often. Is it weird that I would put it in my bathroom? I love so many! A couple favorites: What little girls are made of...I would put it in my youngest daughters room. her walls are EMPTY! I also love Pray he is there, speak he is listening and come what may and love it. There were so many that caught my eye, but the Elephants In Love is just too adorable to pass up. come what may and love it is great! I love the come what may and love it. Come what may and love it!! I am sooooo in love with this quote. I would put it in our family room, which also serves as our daycare room. It would remind me of why I am doing what I am doing. Thanks for the chance to win. I love two of the prints. I love the "stay little" and the "come what may and love it." The "It's just us" is beautiful! I like the Keep calm and Carry On print. Right in my living room for my crazy days! Isaiah 9- It would be cool to have in my kitchen for Christmas time...or the whole year too. Pray He is there. Speak He is listening. Wow, I love that! The elephants are so cute! I like the 'Can't Buy Me Love' print on the site. Would love the Baby Girl Sugar & Spice Print customized for my baby girl! So adorable! I would love "Home Can be A Heaven on Earth" to hang in my entry way. "Come what may and love it" is my fav. Keep Calm and Carry On! I think I need that right above my desk. I also love the Sleep in Heavenly Peace. There are so many to choose from! I especially love the Fine Art Quality- 8x10 Come What May and Love It Print. That talk was so powerful and I could always use the reminder. i love home can be a heaven on earth. perfect. tough decision...i love come what may and love it, caged song, and love is spoken here. I'd pick "Cause Money can't buy... I'd put it in my bedroom. Or "Keep Calm..." in my kitchen. I love cjane's print. I would want to add an elephant since I am pregnant with my third. I would love it in the nursery. Or Pray/Speak....also for the nursery. I adore it. He is always there and listening. I love the custom silhouette and would have one of all my kids in either my bedroom or the family room. "Keep Calm & Carry On" in brown -- for our bathroom. Hubby is English so it'd be perfect! Keep Calm and Carry On - because I STILL don't have one. I'd put it in my entry way. i love laura's designs! she is a good friend of mine is is very talented! I love the "Home Can be A Heaven on Earth" print! It would be great for the entry way! I love Shake It Like a Polaroid Picture for my kitchen... I also love her custom silouettes! I love the "Don't care too much for money..." print and it would have to be in our kitchen, where everyone gathers. I love the Come What May and Love it print. Also the stay little, and many others, but Come what may is my favorite.